So far this week I've been working on cutting and marking the components of Step 2 for Kollette. Kaos has gotten in on the action too; trying to figure out how she can help mark the background squares! I just love this Creative Grids ruler, so handy the perfect size 2 1/2" by 6 1/2", for most of the pieces I end up working with in many of my quilting projects. The Sewline pencil is my favorite marking tool. It has several different leads available to mark any color fabric. 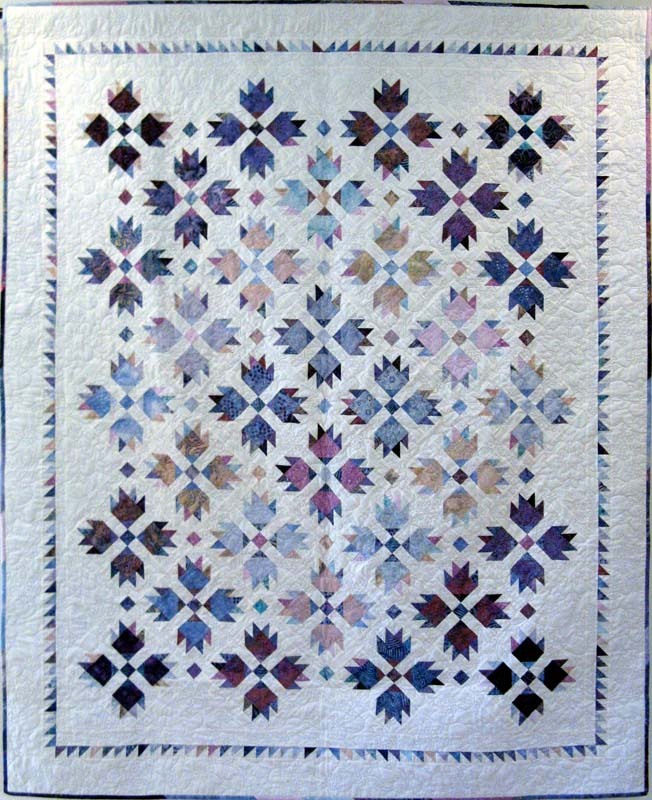 So a couple of tricks I've learned on my quilting journey. Using the usually discarded tips of the flying geese units. Draw a second line 3/8" away from the center line. Next, sew on both lines. Finally, cut between the two sewn lines. You'll have the flying geese units PLUS a HST to use for something else that comes along. The other trick is cutting the dog ears off the HST before you open and press. Notice how they are cut? Hard to explain but you want to snip the tips at a 90' angle; see the still folded HST on the bottom. If you want to know more leave me a comment and I'll put some close ups on a future blog post. I got a comment on my Monday Design Wall post about the name of Kollette's pattern. 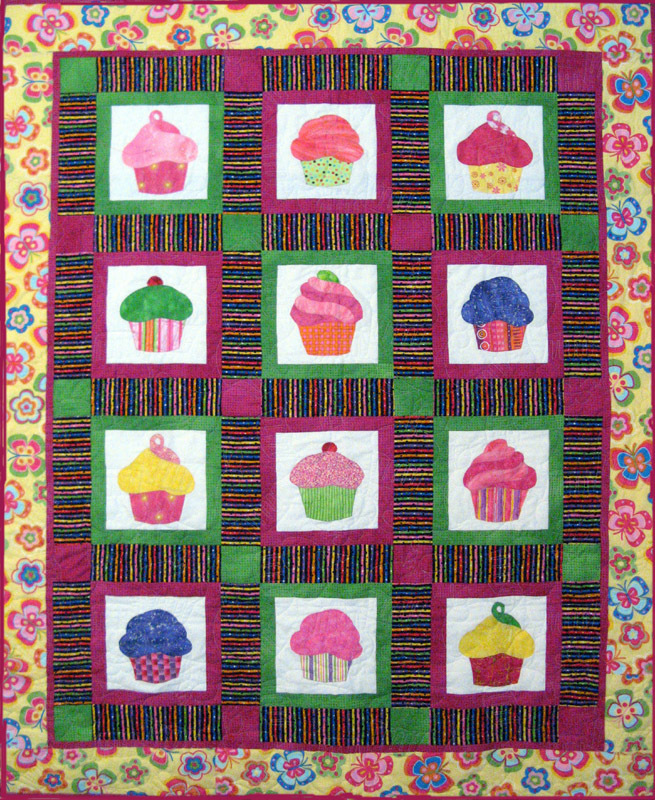 It's called As the Geese Fly by Cozy Quilt Designs 2008. If you are interested contact Cozy Quilt Shop. I'll be working on Kollette the rest of this week and then I'll be changing directions to sneak in a Halloween project from Sep/Oct 2009 Quiltmaker called Any Witch Way. It will be fun working Kreepy with my Mom! Check out more designs this Monday at www.patchworktimes.com (I've made it easy for you with Judy's button). Wow it's been a scorcher here in San Diego this weekend. Today has been the hottest of the heat trend we are having so late into September. We've taken today to be our token air conditioning day. We have central air conditioning but seldom ever need it. This year has been a very cool one for San Diego, one of the coolest in history. Anyway as Bonnie Hunter says "It's Africa Hot" in San Diego! I've finished Koala. Don't really know why this name has stuck with this quilt. It does have browns and tans which initially made me think of the name. It really reads more green so hmmm...maybe we can think of lush bamboo? I do like the way its turned out. I was somewhat skeptical during the process since I was using every green 2 1/2" strip in my stash. With the exception of the "way too blue green" fabric that I took out of four different puss blocks that it ended up in I like how all the greens mixed together. 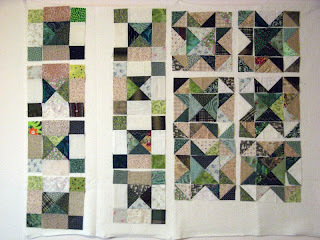 The back is a combination of 10 1/2" green squares, hence I've really put a dent in my green stash. This week starts me off with 20 1/2 yards used and a project completion. Here's my report for this "It's Africa Hot" San Diego Sunday. Hump Day! The rest is all down hill. Gosh with the first part of September having four work day weeks this one has been tough. Since the day light is getting shorter after getting home from work, I've started back up on my morning exercise...rise and shine and out on the pavement at 6:20a this morning. I'll have to admit that it's nice coming home and not having to rush to beat the sunset. Koala is ready for final assembly. I've got all the puss and star blocks done and pretty certain all the hour glass blocks for the border ready to go. I will use the tan paisley print for my inner border that was pictured in the last blog post. I did go back and remove the "not reading green" corner unit in that puss block. Went through the rest of the blocks and removed it everywhere. This one was a blue green that just had to be removed when I noticed how much it popped out after taking the photo. I'll probably do this again when I have it all laid out to make sure nothing else pops out that I hadn't expected. 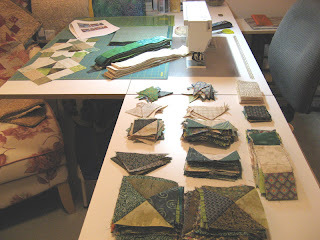 I've also got most of my 10 1/2" squares of green cut and ready to assemble for the back. I've been considering my next project and decided to work on two. One is to be called Kollette. I've chosen this name because it sounds femine and Spring like. 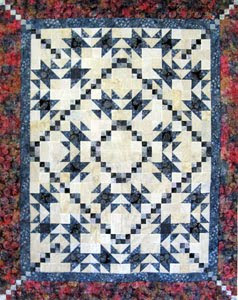 Kollette is a pattern called As the Geese Fly by Cozy Quilt Designs. I'm told that it is a combined effort of Cozy Quilts, Amidon Quiltworks, and Quilt In A Day. I purchased the pattern in 2009 and then in 2010 found the kit of all Batiks at 50% off. Needless to say at that price it came home with me. This project is on my challenges 2010 UFO Patterns that happens to be the last one to complete on the list. My second project is my last 2010 UFO Projects quilt to complete. It will be named for the event that made it come about 2009 Kruisin' Kwilt. During the San Diego Cruisin' Quilters Shop Hop held March 7 -14, 2009 each participating shop passed out a free block pattern (it's done every year). 2009's event theme was stars. I'm still trying to decide on fabric colors, but it will be scrappy as I want to continue using my stash. Sorry no photo of this one as I'll be figuring it's layout along the way. Time to get back to Koala. I'll be posting again on Sunday with my Stash Report. Monday! It's here once again, five full days of 9 hour days ahead...oh boy! Tonight is Canyon Quilters monthly meeting. It's also the beginning of the new TV show season. I'll definitely plan to leave a little early to catch Dancing With The Stars. Sunday had me pretty busy with Koala. 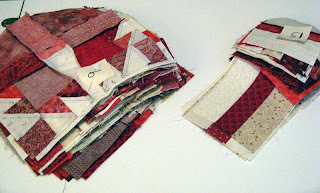 I'm striving to get this quilt complete so that I can move onto something else. I've got a lot accomplished right now; 40 puss blocks and 36 star blocks. I've only got 45 of each to make...getting there, not far off, YIPPEE! Since I wasn't counting I'm not sure how many more hour glass segments I need for the border. I've got quite a few done, but may need more, we'll see. I think I'm happy with the inner border...What do you think? Here's my wall for Monday. It's just a a corner section of the 81" x 89" project that is how Koala is supposed to finish. Check out all the other design walls at www.patchworktimes.com. I have not had much time this past week for sewing. Well I suppose I did but somehow I did not get much accomplished. On second thought I probably did as the final seams of the two blocks are coming together quite quickly when I do sit down to my Pfaff. Monday after work, dinner and the dishes I cut yet more segments for the hour glass and flying geese. A little different this time in my cutting technique...I'm not cutting all at once as I usually would. Honestly I don't know how many more I need to prepare. All I do know is that I've been having to cut more to reach the 45 of each block type. After the cutting I've been paring the pieces and to the sewing room I go. Monday was the day for component assembly. Tuesday and Wednesday were late nights, doing sewing things but not in the sewing room. Sunshine Quilters monthly meeting and the Preview Night for the San Diego Quilt Show....oh that reminds me I need to pick up my quilts today at 1pm. Didn't hear about any potential buyers for them, but last year I didn't hear from a buyer until nearly a week after the show. So I've not dropped the possibility just yet. I didn't make any fabric purchases at the show. I did purchase a cute pattern by Whistlepig Creek Productions. No I didn't break any of my sewing rules as it isn't a quilt pattern! 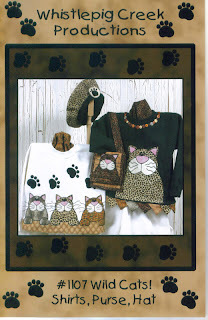 It is a pattern called Wild Cats! that presents two styles of decorated sweatshirts, a wallet type purse, and a cute beret. This will make into a very cute Christmas gift for Morgan my soon to be three year old niece. Thursday was more cutting and paring of pieces. Around 10pm I got to assembling the two block types and got 24 of one and 11 of the other together before I ran out of components. Friday was my OFF Friday (love the short weeks). I spent time with household chores and errands after my exercise. I spent a few hours sewing components before my DH and I took off for our Friday Night Date. We went to Ali Baba's Cave. This fun Mediterranean sports bar and restaurant is located just a few miles from our home. They have hookahs and live entertainment that starts at 9pm. Before the evening was out I had to get involved in the lively entertainment...gave my best attempt at belly dancing... I even had DH shuffling his shoes. No you sillys DH was slow dancing! Saturday I packed up Koala for my sew day with Kerry, but ended up instead with the second project I packed up worked on instead. We together sorted out anything less than 1/2 yard pieces from a tote pan of neutrals, pressed and cut into either 3 1/2 or 2 1/2 inch strips. Not what you call a fun day, but it will make pulling the next quilt project together quicker. Here it is Sunday, the start of a new week. Tomorrow is Canyon Quilters monthly meeting so sewing today and then next opportunity could be Tuesday. No purchases and no used to report this week. I'm shooting for a used to be reported next week. Happy Sewing to All! Monday I turned in my three San Diego Quilt Show entries. I received lots of very nice comments from the volunteers as they processed my quilts in. I was told when volunteers were hanging the quilts at the San Diego Convention Center Karnations Karnival was getting all kinds of oohs and aahs. 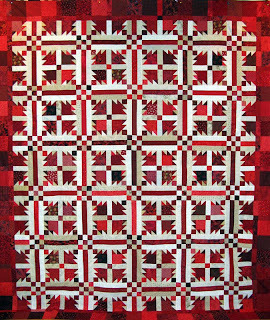 Karnations Karnival is one of many that are part of a group entry from a Mystery Project done with members of Canyon Quilters. Tuesday was Sunshine Quilters guild meeting. It was the first meeting of the 2010-2011 Membership Year which always starts with an Ice Cream Social and Announcement of Officers. We have a great schedule of lectures and work shops...one of which is me in May 2011. I sure was honored to be asked, it will be my first lecture that will include a trunk show. I'm a bit nervous and excited all at the same time. Now its Wednesday and the only sewing progress made so far on Koala is cutting more 2 1/2" strips to make more of the hour glass components and flying geese components. I did sew a little on Monday night after being disappointed with the Chargers loss. Yes they are always slow starters so I suppose I should have been expecting the outcome...always nice to hope for a win though. This photo is where I've been cutting my strips and pieces. You'll notice the surroundings. The two tote pans are part of my stash, the neutrals and the yellows (and purples in the back of this tote). Next is where I store my rulers and extra cutting mats. Then there is the surface where I cut or stage projects I'm working on along with my electronic picture frame that holds images of many of my quilts, family and friends (notice the Red Hat quilt?). 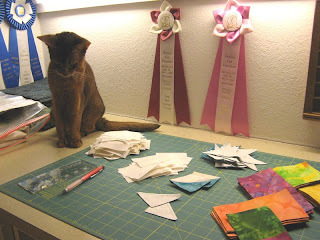 Then above the surface are Kaos' Cat Show Ribbons and my thimble collection. The shelves are filled with patterns to the left and a variety of nick nacks that are either sewing or cat related in nature. There's lots more stuffed into this former closet that I had converted into a more useful work and storage area in my sewing room. I've been delighted with this investment since the day it was built. Tonight is the San Diego Quilt Show Preview Night. 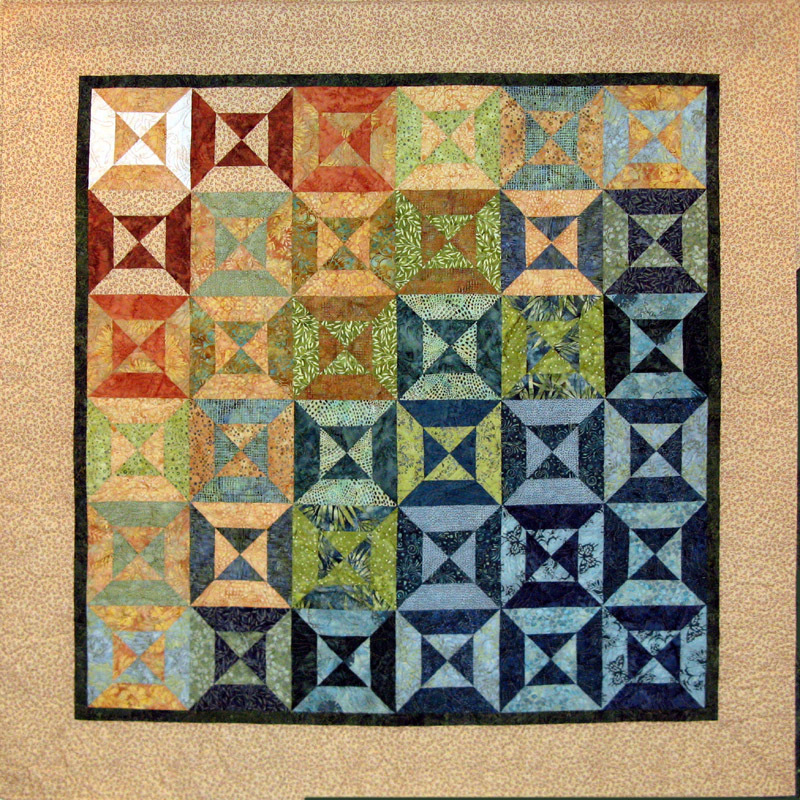 I will volunteer a little bit of my evening selling chances on Sunshine Quilt Guilds Opportunity Quilt Golden Nugget and enjoy all the beautiful quilts and be tempted by all the vendors. You'll see if anyone got me on Sunday when the Sunday Stash Report is posted! Already the middle of September. My how time passes quickly. Football is in full schedule with three games yesterday and two games tonight. Of course I'm interested in the late game where the Chargers are poised to win! Go Chargers! 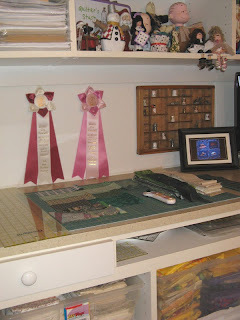 My design wall is on my sewing table this week. 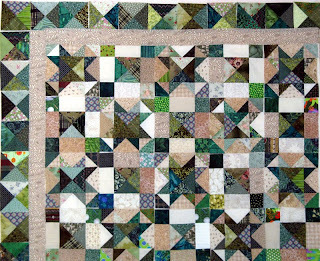 I've been sewing away on the different components of the two blocks and border but have nothing really to show except all the stacks. I've got quite a few more to assemble, especially the hour glass component. One thing I've realized is that I never needed the 696 hour glass components that I mentioned earlier. That huge number was the amount of triangles that needed to be cut to make what was needed or only 170 components. I really did think something was out of whack! Here's Koala in pieces. I hope to make lots more progress throughout the week. Today is entry check in day for the San Diego Quilt Show that runs September 15 thru September 18. I'm planning on attending the Preview Night on Wednesday. The vendors will be there along with opportunity quilts as well as all the beautiful entries for this years event. I've got three on display; Karnations Karnival, Kool, and Karmel Kolors. Karnations Karnival will be part of a group display with other members who participated in Canyon Quilters 2009 Mystery Challenge Project that I coordinated. 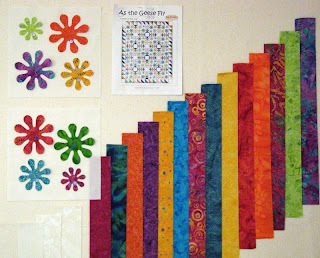 Tomorrow night is Sunshine Quilters first meeting of the new membership year. 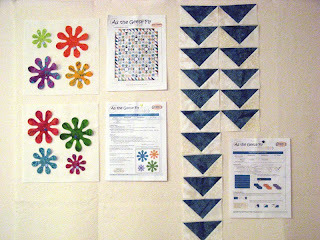 Their opportunity quilt that will be offered for chance makes its first public appearance at the San Diego Quilt Show. Kerry and I assembled Golden Nugget. Let me know if you want a chance! I had a very busy work week which unfortunately led to not too much sewing time. By the time you finish an eleven hour day, make dinner, clean and put away dishes and tidy up little time is left in the day. 6:00 am comes early for me. I did get in several hours yesterday which resulted in 87 of the 696 hour glass components that will be needed for Koala. I received the fabric ordered for Kufflinks from Hancock's of Paducah on Friday. Just as perfect a fit for Kufflinks as I'd hoped for. I'm always a little bit apprehensive that the color online is representative of the actual fabric when it arrives. Preparing it for the back was the first seam taken Saturday. Now the package is complete and ready for quilting. It's first in my queue at Kerry's Quilting. Since I'm still busy with Koala I'm not posting as fabric used. I'll be showing 20 1/2 yards when the time comes. This week will be a busy one with Sunshine Quilters meeting on Tuesday evening and the San Diego Quilt Show Preview Night on Wednesday evening. Looks like I'll have opportunity for sewing today and a couple of days during the week. I'm progressing pretty well as I've got a lot of the components complete. It's just those wonderful 609 hour glass components that looms ahead. They do go very fast though. I'll post a picture of Koala later today. So here's my numbers for this fine day in September. Already the middle of the week. Sure seemed to go by fast, but Monday being Labor Day and a day off made it so. Okay certainly by me. Two more days of work after today and the weekend will be here. Don't you just love short weeks? Unfortunately, a long five day week is right around the corner :(. Monday was a great sewing day that I got lots done toward my current project Koala (still playing with this name....). I cut into more of my green stash as the already Scrap Users System was depleted of green 2 1/2" strips. Can you hear excitement? I had to do this pretty much from the beginning for the 2 1/2" strips of neturals and tans. I cut up neutral stash that I've had since 2007 when I purchased for Katastrophic Kraze. Can you hear excitement yet? I've put together both blocks for Koala and I'm liking what I see. (There are lots more put together that aren't in this photo.) I've not been counting yet so I may have more than I need of the triangle shape in the green that becomes the hour glass unit used in all three star, modified puss, and border blocks--but that is okay because my quilting buddy is making the same Bonnie Hunter My Blue Heaven! pattern and will happily accept any of them I don't need. Not sure if I'll be far enough along to claim stash used on Sunday from Koala. I didn't get an opportunity to sew last night since work claimed an additional two hours of my day. I've had time only to put labels on Kupkake, Kastanets and Flip Flops. Haven't received Kufflinks back fabric from Hancock's of Paducha yet. Hopefully my quilter also my quilting buddy (aka Kerry of Kerry's Quilting) will have a batting large enough for Krimson Khat or that will be a purchase I'll need to take care of this weekend. The 29th annual San Diego Quilt Show is next week Wednesday, 9/15 Preview Night with the Show Thursday, 9/16 through Saturday, 9/18. 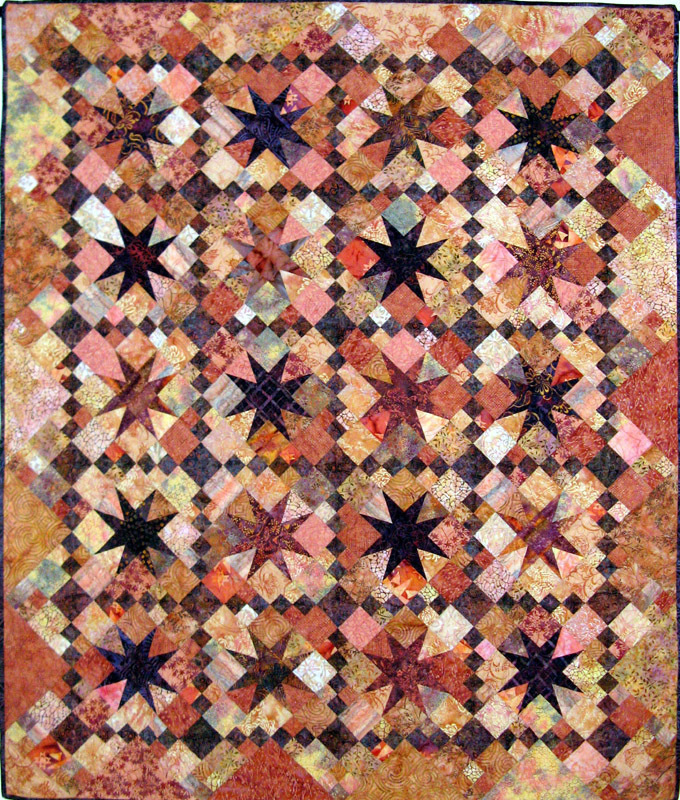 Quilt turn in is Monday, 9/13 which starts my involvement. I've got Karmel Kolors, Kool, and Karnations Karnival entered and offered for sale. Sunday, 9/19 is pick up--wish me luck that I'll have less to bring home than I dropped off! Note: Flip Flops, Kufflinks, and Krimson Khat can be seen on earlier posts. Links to Bonnie Hunter's My Blue Heaven! can be found on earlier posts too. Happy Labor Day. I hope like me most of you have a day off from work and are enjoying your sewing room. I've got a barbecue planned for dinner. We'll cook up some rib eyes for the two of us. I'm deciding between two names for my current project. It will be either Kuite Kontent or Koala...or maybe neither... I'm looking for a name that represents something from either the colors I'll use that are green and neutrals with a little tan (this is where Koala comes into consideration) or something derived from the pattern's name My Blue Heaven (a stretch but Kuite Kontent plays in here). I've got so many greens in my stash that it must be tamed! I sucumbed to a purchase this week. I've got Kufflinks (Lyn Mann pattern called Chain Reaction) at my quilters waiting for a back since early this year. This quilt project has had some unfortunate luck with finding one. I found the 6 yards needed online through Amazon; placed an order and it never came...not happy! Turns out it wasn't available any longer, but I didn't learn about this for sometime. Tried again through Sew Batik which is one of my favorite places to get batiks). I quickly learned that the fabric I selected was not available at this time, but would be around December if I wanted to wait. Oh darn, strike two for Kufflinks. Then the wonderful Hancock's of Paducah catalog arrived and shorthly thereafter an email sale announcement...both haunting me... I found a Moda Frost Ice fabric that was perfect for Kufflinks...now would they have enough? So I called them, checked stock and placed an order. Let's hope its not strike three! Check out all the other Design Walls on Patchwork Times. I had a very successful week. Krimson Khat is ready for quilting so I'm going to claim my 25 1/2 yards stash used this reporting. I'll post a photo of this gorgeous quilt a little later today. 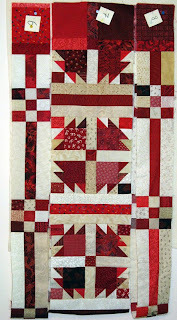 I needed 99 10 1/2" red squares to make the back large enough to fit. Now that's using up your stash! As I mentioned I got my EZ rulers last week. I've already broken them in working on my next project to use up fabrics from my green and neutral stash. 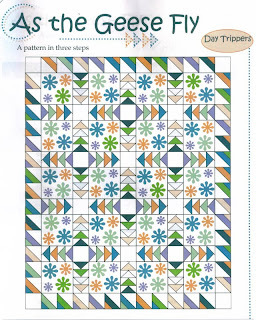 I'll be using Bonnie Hunter's pattern My Blue Heaven. It is a two block quilt that needs 45 of each block. 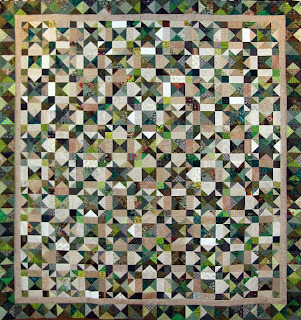 The quilt when finished should measure around 81" x 89". 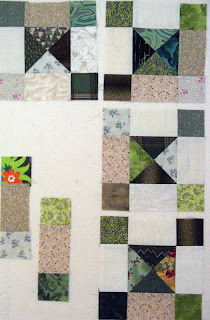 I plan to use 10 1/2" green squares for the back. Needless to say this one will bust some stash too. I'm still playing around with a name. I'll leave that for thought today and bring it to you tomorrow with more details on the project. I finished the hand sewing portion of the binding on Flip Flops watching TV with DH on Monday night. Kaos certainly enjoyed the evening too; snuggled nicely within the folds of the quilt while I worked. I'll be ready when the time comes for another binding project. I finished the layout of the remaining rows on Krimson Khat last night; unfortunately way too late to assemble much of it before bed time. I sure didn't want to stop as it will take me time to spread out all the small piles of sub pieces to get going again on the sewing. Oh well, the downside would be pieces scattered about from Kaos and Komotion looking for the "red bird". I'll be able to get a quicker start tonight since it is my "OFF" exercise night and fortunately there are leftovers--sorry DH! All looks to be a go for posting a "25 1/2 yards used this week" on the Sunday Stash Report. I wish everyone a terrific holiday weekend and keep in mind how Labor Day came to be celebrated.